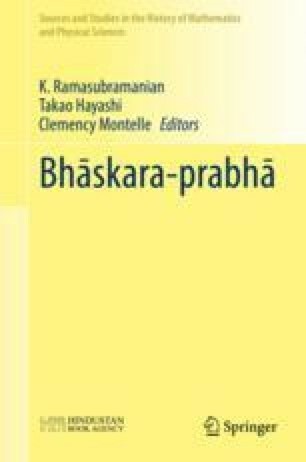 Bhāskara’s Bījagaṇitam (BB) contains 11 chapters consisting of 187 verses pertaining to algebra, 2 introductory verses and 9 verses in the epilogue [BīGa1980, pp. 7–59]. In the second verse of the epilogue Bhāskara admits that this text is compiled by selecting notable ideas from his predecessors like Brahmagupta, Śrīdhara, Padmanābha and others [BīGa1980, p. 52]. This is certainly the case in the chapter entitled karaṇīṣaḍvidham (six operations on the surds).